The Fukushima I Nuclear Power Plant also known as Fukushima Dai-ichi(dai-ichi means “number one”), is a disabled nuclear power plant located on a 3.5-square-kilometre (860-acre) site in the towns of Okuma and Futaba in the Futaba District of Fukushima Prefecture, Japan. First commissioned in 1971, the plant consists of six boiling water reactors (BWR). These light water reactors drove electrical generators with a combined power of 4.7 GWe, making Fukushima Daiichi one of the 15 largestnuclear power stations in the world. 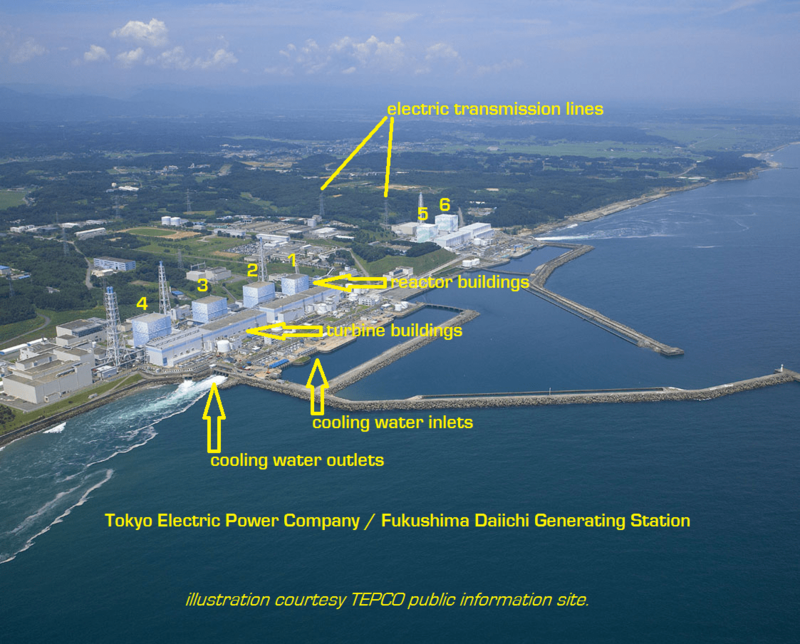 Fukushima I was the first nuclear plant to be constructed and run entirely by the Tokyo Electric Power Company (TEPCO). The plant suffered major damage from the 9.0 earthquake and subsequent tsunami that hit Japan on March 11, 2011 and is not expected to reopen. The location of the plant was on a bluff which was originally 35-meters above sea level. During construction, however, TEPCO lowered the height of the bluff by 25-meters. One reason the bluff was lowered was so that the base of the reactors could be constructed on solid bedrock to mitigate the threat poised by earthquakes. The lowered height, however, would result in the plant being more vulnerable to tsunamis. 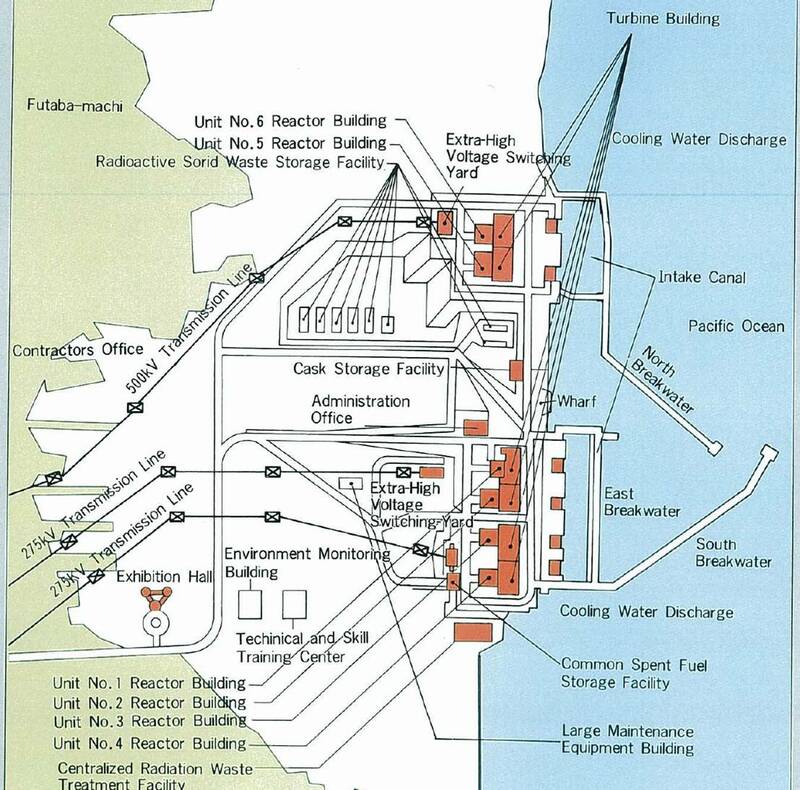 The Fukushima Daiichi site is divided into two reactor groups, the leftmost group when viewing from the ocean contains units 4,3,2 and 1 going from left to right. The rightmost group when viewing from the ocean contains the newer units 5 and 6, respectively the positions from left to right. A set of seawalls protrude into the ocean, where water intake is in the middle, and discharged on either side.